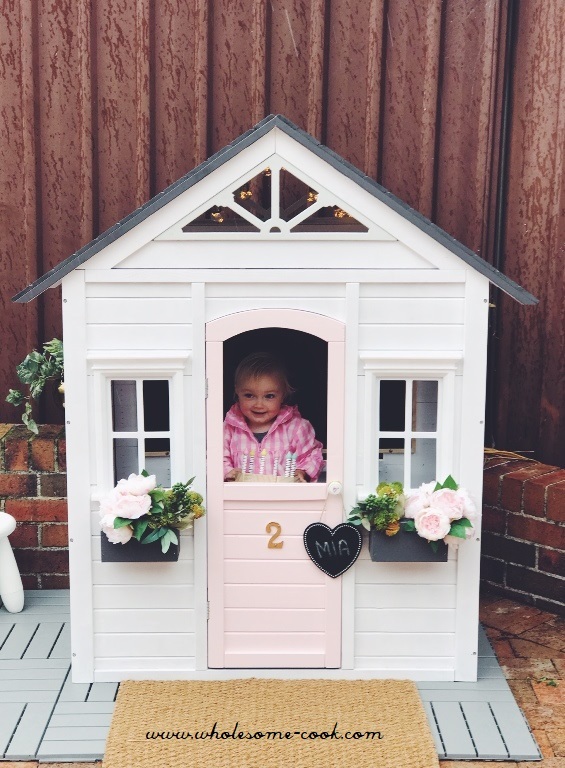 I’ve had so many of you ask me questions about Mia’s 2nd Birthday Kmart Cubby House makeover on Instagram and Facebook, I have decided to post it all here for your reference. And yes, there will be a kitchen and servery window going in! I’ll pop those details in too. I cannot believe Mia is 2 already! It seems like she was only born yesterday. I remember the day and I cried as much on the day of her second birthday as I did on the 7.10.2016. 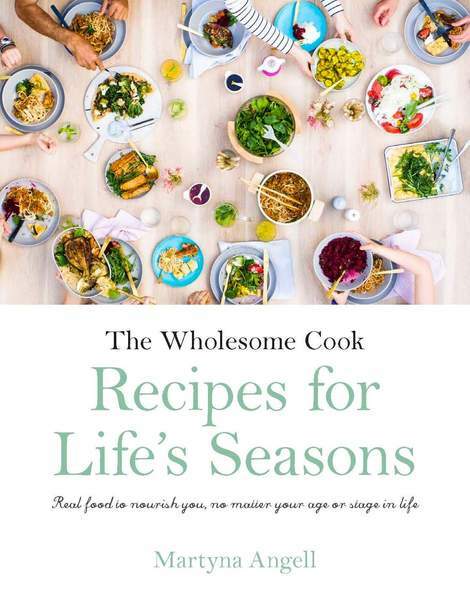 She’s so happy and bubbly and such a great sharer and entertainer – she’s always making sure everyone has food in their hands. Her cuddles are the best thing ever and her smile so infectious. As any 2 year old today she’s obsessed with the Baby Shark song. And is currently mixing up her Polish and English in such a cute way, I can’t even. And this was the best Birthday gift idea! This time the project was a little smaller, but just as exciting! More so probably, because it turned out super cute and I absolutely want to move in. Mijka loves it too, she has spent every morning and afternoon playing inside and serving me imaginary foods out the side window. 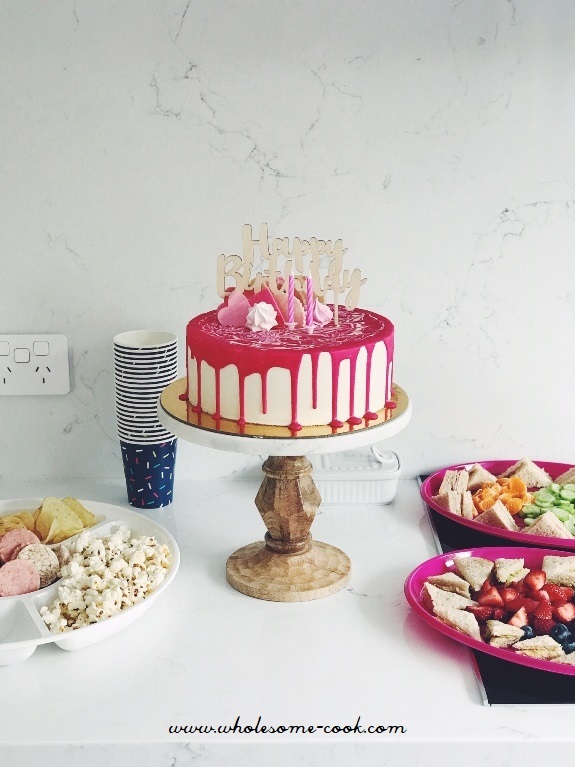 We had a little birthday do for her, and whilst I didn’t bake the cake, I made some cupcakes and nourishing snack platters for all her little friends to enjoy. 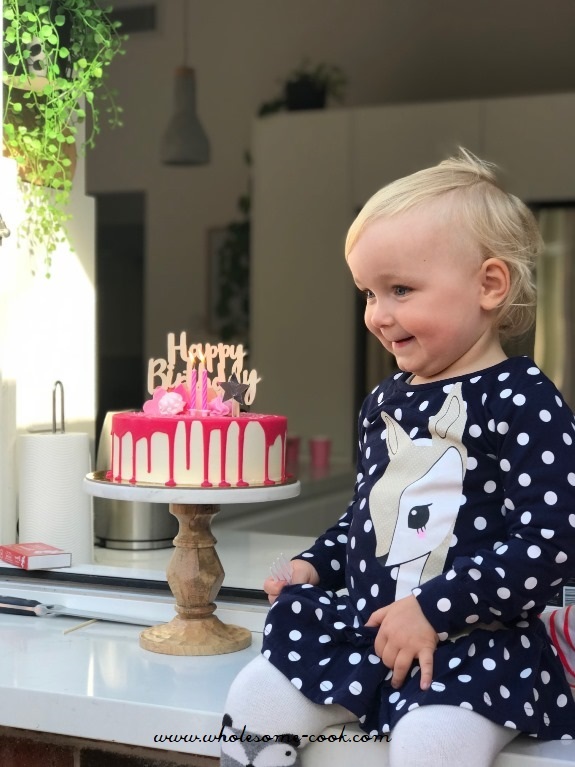 You can check out Mia’s 1st Birthday Cake here. And then, on Sunday Matt, Zac and Liana came over to help put the cubby together and open some presents. It took me 2 full days to paint and the boys put it together in about 2 hours. 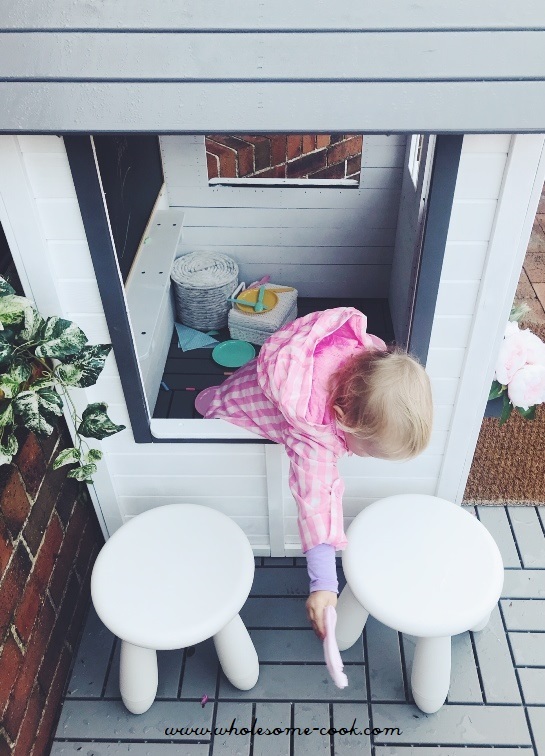 I love the colour scheme – will be painting the back fence the rood colour for sure – and looks better than I could have imagined and Mia loves playing in it! 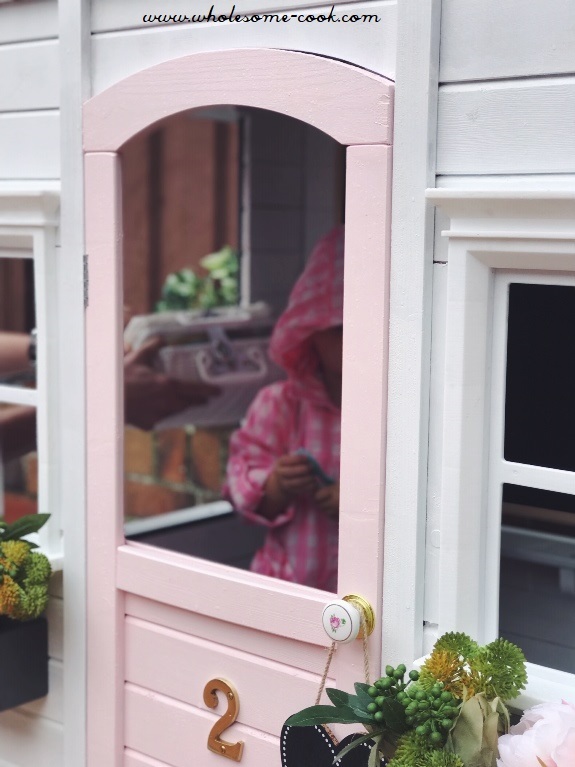 The cubby is the most affordable out there, but be aware that the paint and accessories will set you more than the purchase price of the actual house. Still, totally worth it if you’re feeling creative. 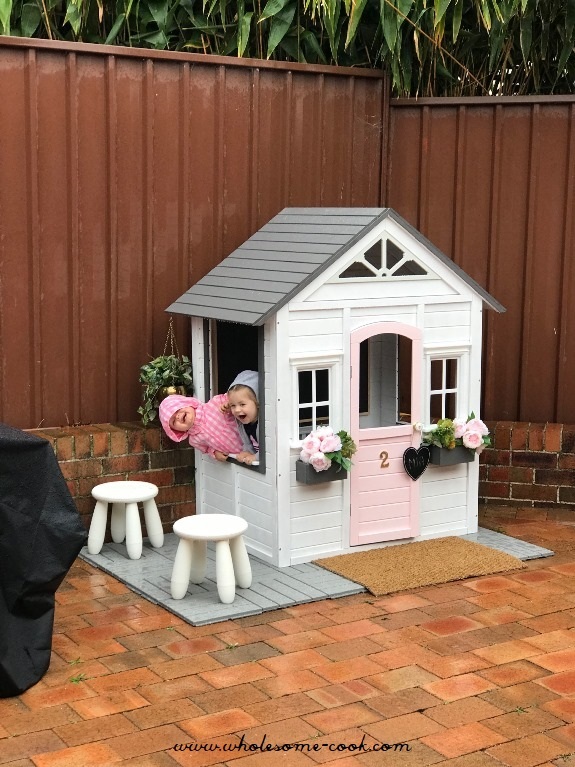 I purchased the Cubby House from Kmart. Ring around to see who has stock as it is not available online. I decided to paint the whole house before assembly. I removed the plastic windows, triangles near the roof and took the door off to make the job easier, less masking. 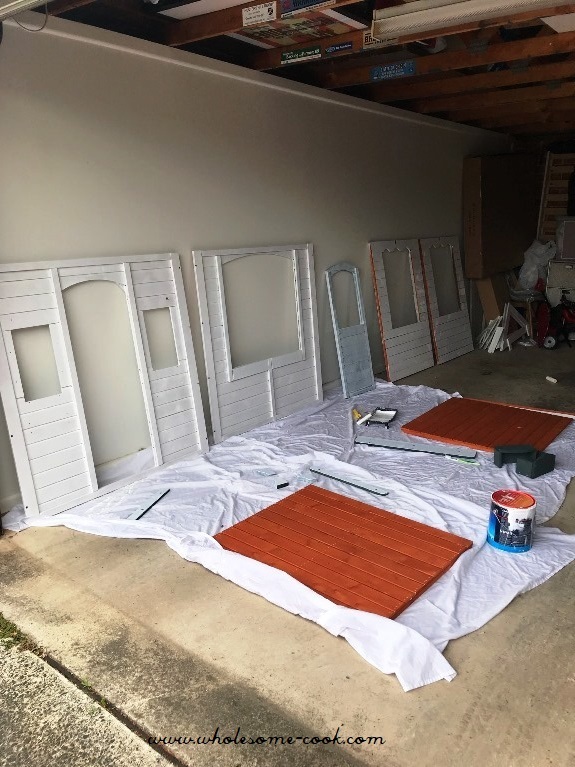 I used Dulux Weathershield in Vivid White low sheen for the walls (3 coats, bought 4L), Raku semi gloss for the roof and window trims (2 coats, bought 4L) and Fairy Wings in gloss enamel for the door (3 coats, bought 1L). I only used about half of the amount of paint bought and the painting took about 2 days to allow time for each coat to dry. 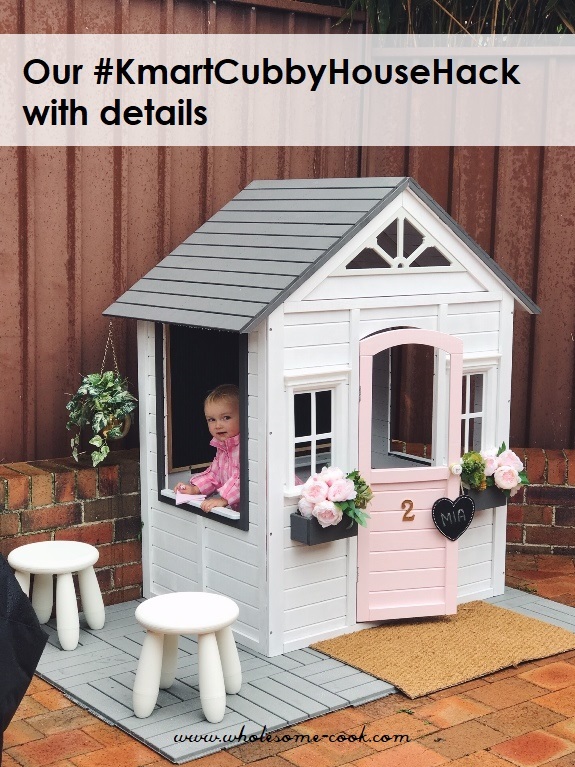 Once the paint was dry and the house ready to assemble, we attached the 2 brass house number – snipping the screws off halfway with pliers) and Prestige ceramic door knob with pink flower both from Bunnings. Green flowers and peonies in the planter boxes are from Kmart. As is the brass plant hanger attached to the roof with a TIC 38mm cup hook. The inside star wire globe string lights are also from Kmart. I used 3m command decorating clips to secure the string lights to the roof and hot glue to secure the light switch near the window. The ivy plant, decking, door mat, photo frames inside (hot glued the frames to the inside walls once the house was put together) are from IKEA. As are the plastic stools. The decking is nifty as it keeps the cubby off the wet ground and prevents the floor of the cubby from being overly wet when raining. 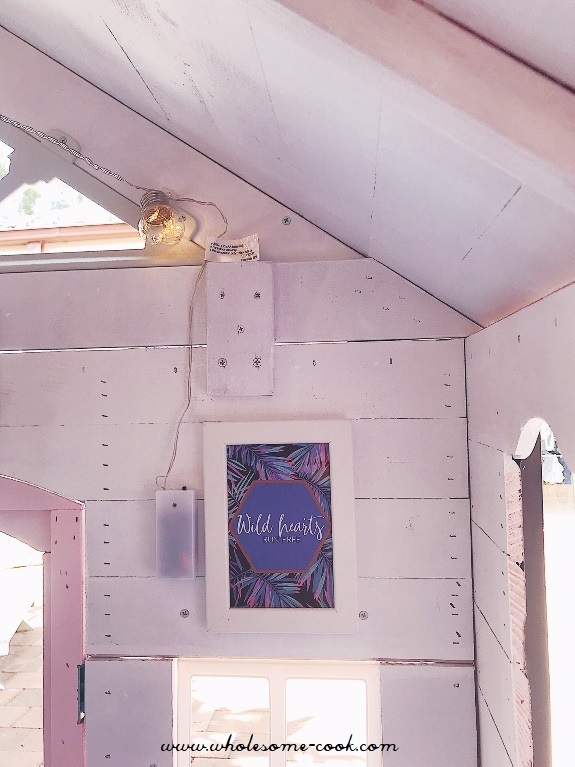 I decided to skip the brass bell you might have seen on many of the cubby hacks because the kids LOVE ringing it. Constantly. Parents and neighbours not so much. Postcards and heart blackboard sign are from The Reject Shop. The back window is covered by a blackboard – it was facing the fence anyway – picked up from my local $2 shop and I installed the back window shelf inside instead of out to make room for chalk, etc. I will be adding a shelf to the left hand side window to make more of a serving counter and installing this Kmart tabletop kitchen under one of the windows inside. Soooo, what do you think??? 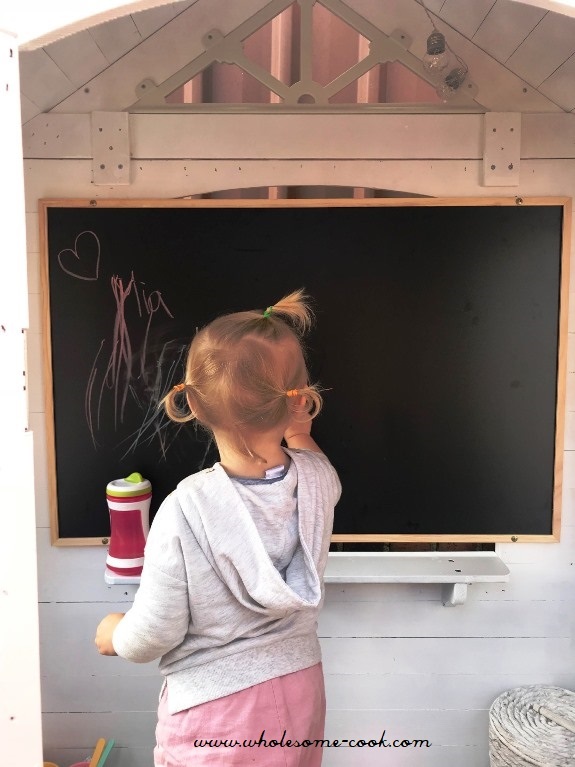 I think it is the PERFECT birthday gift for a 2 year old – made over or not, but I do recommend installing the blackboard for some good old-fashioned fun out of the sun (and rain). 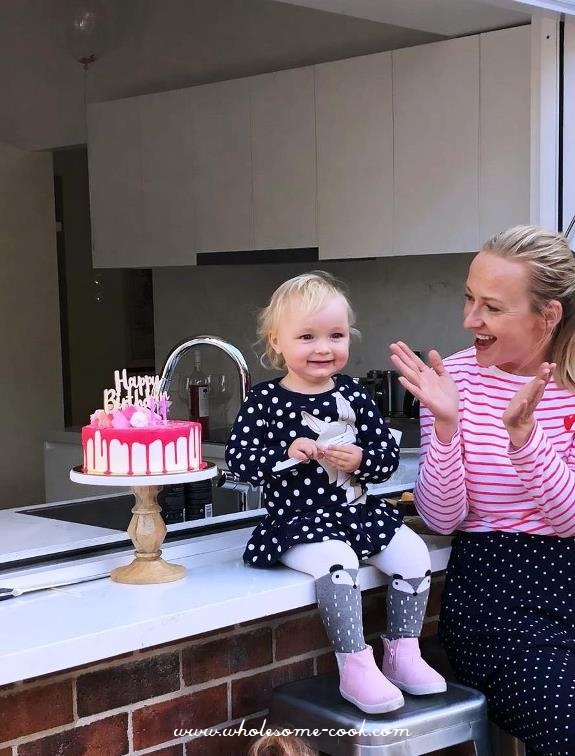 Hope she had a lovely birthday, can’t believe she is already two! Thanks Shellie! Well, one of the big house, one of the tiny house and gearing up for a reno of my Dad’s apartment. Also have a few friends asking for advice on their renos which is a nice bonus!